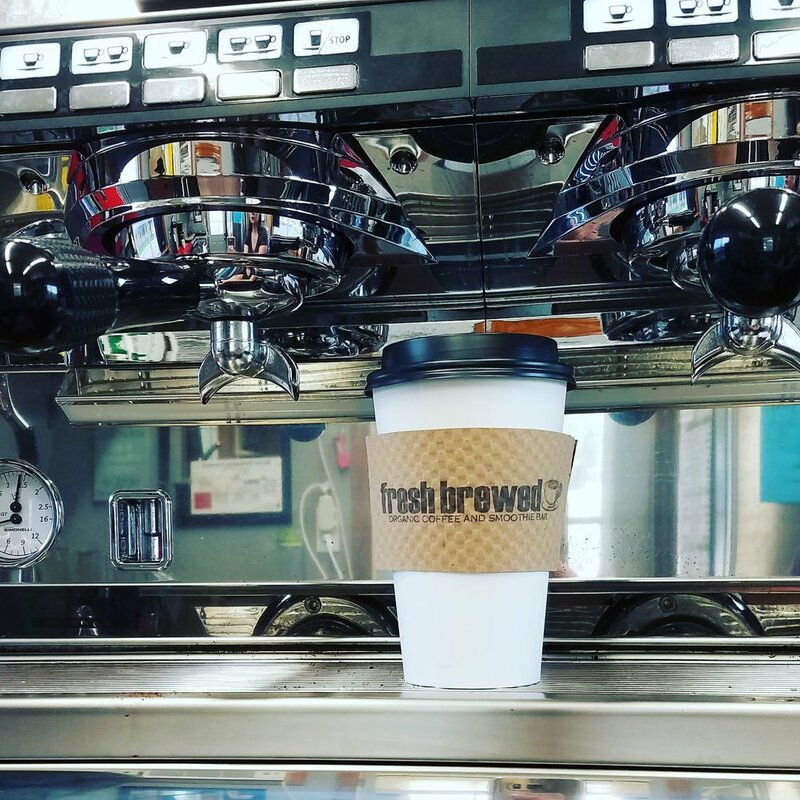 Fresh Brewed is located at 502 Main St., Williston, ND. Directly in front of Elite Fitness. When it came to selecting coffees, not only to use in our café but also to carry in the store, quality was key. We chose Jim's Organic Coffee for our café use, based not only on amazing flavor but the high standards they hold themselves to as a company. They are certified organic by the USDA and Oregon Tilth. This means that their coffee is grown without synthetic pesticides and fertilizers and also ensures their coffee is non-GMO! Yay for putting whole organic goodness into our bodies! Their method also ensures that their coffee benefits the environment. Coffee trees are grown in the shade of naturally occurring species like banana, mango and orange trees. In contrast with standard farming practices that destroy the natural ecosystem, this method supports it. Wildlife like birds and dragonflies thrive and help keep insect populations low eliminating the need for harsh pesticides. Fair Trade is something we hear a lot about these days, but what does it really mean? According to Jim's it means long standing and established relationships with trusted farmers, paying more than fair prices to help maintain the livelihood of the individual and the community of that farmer. And most of all it means treating their farmers as people with the respect and dignity they deserve. Jim's is also a B Certified Corp. This speaks to their continual efforts to be socially and environmentally responsible. All the electricity used at their roasting facility and office is produced by windmills! Now if all this wasn't enough their coffee simply tastes amazing! If you're looking for something to brew at home or a delicious drink made with the best we've got you covered. Mighty Missouri Coffee Co.| Montana Coffee Traders | Green Street Coffee Co.
We also offer a selection of whole bean coffees available for purchase at our store, Fresh Palate. The benefits of buying your coffee whole bean are something we will go further in depth in on a blog post, but trust us. It's the way to go. Don't have a grinder at home? No worries! Tell our baristas how you will be brewing your coffee and they can grind it fresh for you at the store. Espresso Jimbo is a dark medium roast we use at our café. This means it is heavy enough to cut through the milk of a latte or cappuccino, but not so dark as to burn off essential flavor notes that give it a pleasant taste when drank alone as a simple espresso or Americano. Notes to look for are spice, dark chocolate, berry, citrus, lemon and milk chocolate.